28 towns answered the call for actions for the World Week for the Abolition of Meat and organized 30 events on January 30th and 31st. The activists created effective happenings: performances about animal slaughter and about reclusion in farms, video projections of animal slaughters. 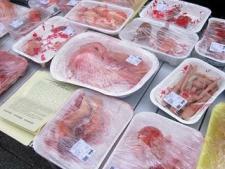 In some cities, activists offered people “human meat” trays. Veg*ans didn’t just spread ethical food practices: they spoke about meat abolition and openly demaned the end of the ongoing slaughter! Complete reports with photos and videos from each town will be available at http://aboliamolacarne.blogspot.com (photo gallery here: http://picasaweb.google.it/abolizionecarne). The Italian Network for the Abolition of Meat wishes to thank all the activists for their contribution and hopes to see them soon.